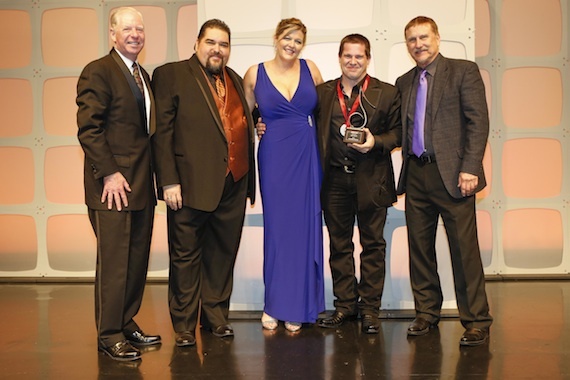 The annual SESAC awards banquet has always had a family feeling, but this year the organization took it literally. “Do you believe this s—t?” he exclaimed. “You guys have been awesome.” He recalled how Shannon stood by him and encouraged him when he was dropped from his publishing deal seven years ago. Now he is the co-writer of such hits as “I Don’t Dance” and “Good Night Kiss,” which earned him his honor. During the banquet, those songs were performed by the mighty voices of Lee Brice and Randy Houser, respectively. They both drew standing ovations. “He truly is family,” observed SESAC’s Tim Fink. 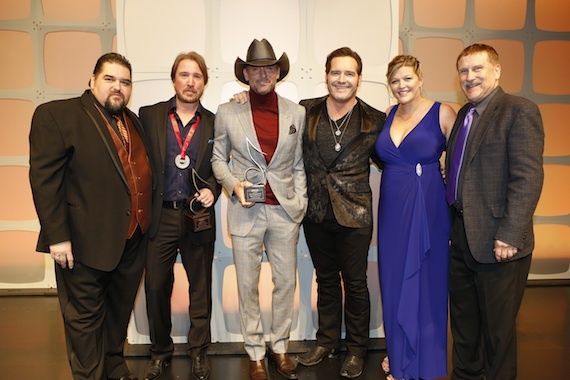 To kick off the banquet, he introduced Jerrod Niemann, who performed a spirited version of the Song of the Year winner “Drink to That All Night.” Superstar Tim McGraw made a surprise appearance to present the award to Lance Miller, since the songwriter is signed to his publishing company. 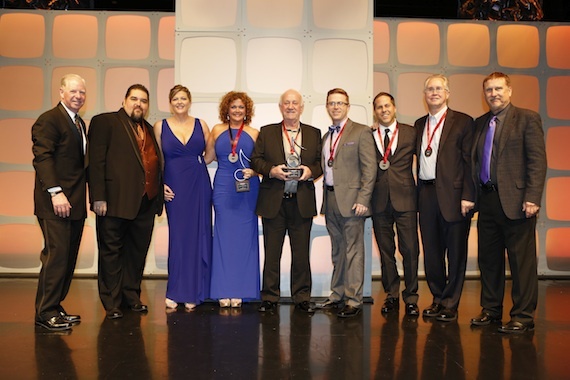 For the second year in a row, Legends of Magic Mustang Music was named SESAC’s Publisher of the Year. The event was staged Sunday evening (11/2) at the Country Music Hall of Fame & Museum. At the cocktail party, we were served h’ors d’oeuvres including shrimp & shaved asparagus, mushrooms in puff pastry and sweet potato biscuits holding braised pork belly and coleslaw. Munching and mingling were Jeff Balding, Jeff Walker, Jeff Gregg, John Allen, John Grady, John Mullins, John Beiter, Peter Cronin, Peter Cooper, David Wykoff, David Ross, Tom Luteran, Thomm Jutz, Pat Higdon, Pat Finch, Dan Hays, Dan Hill, Charlie Stefl, Charlie Monk, Ron Stuve, Ron Cox, Bob Doyle, Bobby Rymer, Rob Simbeck and Rod Essig. During cocktails, Heather McBee introduced me to pop piano sensation Jim Brickman. I complimented him on his good taste in beginning his Nashville experiences by collaborating with Martina McBride back in 1997. Unique among the performance-rights organizations, SESAC also honors Americana composers. Amy Beth Hale saluted such creators as Pete Sallis, Victoria Shaw, Adam Chaffins, Rick Scott and Jim Lauderdale. The Hall of Fame’s event space glowed in amber and gold tones. Walls were splashed with abstract lighting designs. The stage was backed by stacked pale-orange cubes and floor-to-ceiling rusched metallic-bronze fabric. Tables were draped in metallic-gold cloths with red geometric designs. Centerpieces were clusters of pink roses, pom-pom mums and calla lilies accented by succulents and surrounded by amber-glass votives. Overhead, were faux-baroque chandeliers with crystal beads. “We’re on a roll, guys,” he proclaimed. He also reminded us that SESAC has begun construction on a massive new headquarters on Music Row. Brett Warren, Brad Warren, Mary Martin, Troy Tomlinson, Erin Enderlin, Gilles Godard, Fletcher Foster, Susan Stewart and Webb Wilder applauded. So did Kim Williams, Kos Weaver, Kent Earls, Jerry Salley, Jennifer Kennard, Jed Hilly and Holly Bell. Not to mention Drew Alexander, Don Henry, Arthur Buenahora, Anthony Smith and Al Moss. 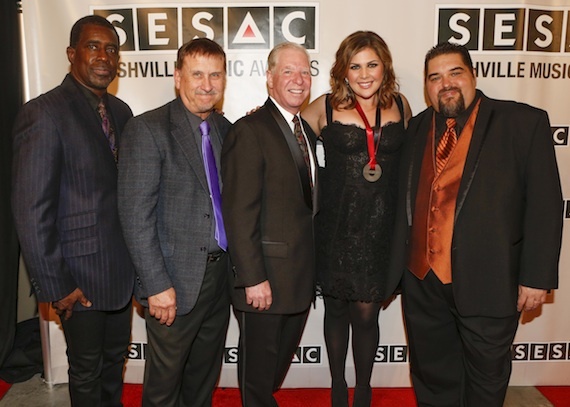 Pictured (L-R): SESAC’s Pat Collins, Tim Fink and Shannan Hatch, Magic Mustang Music’s Juli Newton-Griffith, Benny Brown, Keithan Melton, Jon Loba, Rick Shedd and SESAC’s John Mullins. Guests were garbed festively. Carla Wallace was in a black velvet tunic with and open-collar wide-lapelled blouse. Lisa Harless was glamorous in a floor-length crimson gown. Tinti Moffatt wore a knee-length dress with a white-and-silver herringbone pattern. Jill Block looked stunning in a floor-length black lace evening coat over a sequined teal bodice, plus leopard-print stiletto heels. Caroline Davis sparkled in a silver-sequined evening jacket. Singing newcomer Lacy Cavaliere was lovely in a black-and-gray leopard-spots ensemble. The men were not to be outdone. Jim Lauderdale was trim in his appliqued black Nudie jacket. Both Webb Wilder and Thomm Jutz sported fedoras. Seab Tuck wore an art deco silver tie. Brad Kennard had the evening’s best shirt, a crisp white crossed with black and red checks and featuring black collar buttons. A.J. Masters was distinguished in his white goatee. Power couples gliding through the elegant evening included Kathy Mattea & Jon Vezner, Gary Burr & Georgia Middleman, Rick & Janis Carnes, Craig & Pam Brown Hayes and Fats Kaplan & Kristi Rose. We dined on citrus and fennel salad with lavender balsamic dressing, followed by strip steak, mango salsa on snapper, grilled corn quinoa and asparagus. Mixed-berry napoleon with filo pastry was presented for dessert. “It’s been a fun night, right?” said Tim Fink at the banquet’s finale. Behind him, the Hatches hugged.